Can you tell that I love to collect old family photos? The photos on this site are just a few of the ones I have! I just LOVE this picture! Must have been quite a party (maybe a wedding?) What I especially like is the fact that some of the people in the photo are not so stiffly posed, as is the case in most antique photos. I'm not sure who are the people are in this photo, except that I've been told that the three young men on the back row and the young woman in the middle of the back row are children of Barbara Elizabeth STROUP Kidd and her husband, E. C. "Tim" Kidd. I think that the young man in the center of the photo is my grandfather, James Franklin KIMERY. It's really hard to tell in these old pictures, since the Stroup resemblence is so strong, and so many of the cousins look alike. Even today, some of our family are being mistakened for very distant Stroup cousins whom we have never met! I wish I had an original of this photo. I have a very small portion of the original, and only got this copy of the whole picture when a distant cousin, Reilly Kidd emailed it to me. Thanks, Reilly! I will add the names of all the people in this photo a little later. 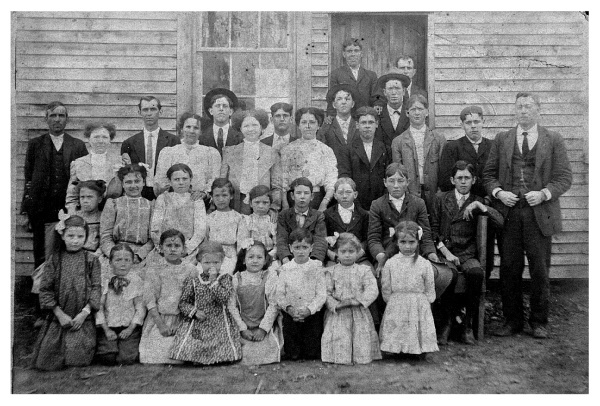 This is a photo of the entire student body of a small school in Tippah County, MS in the early 1900s. My grandfather, James Franklin Kimery, is the man on the back left, and is supposed to have been a trustee of the school. 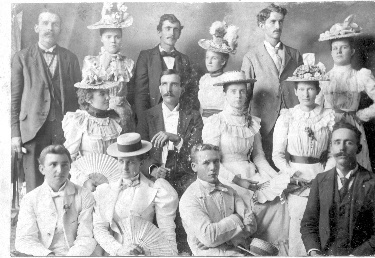 The young girl and boy in the front left are his children, Velma Marie Kimery and Willard Elmo Kimery.